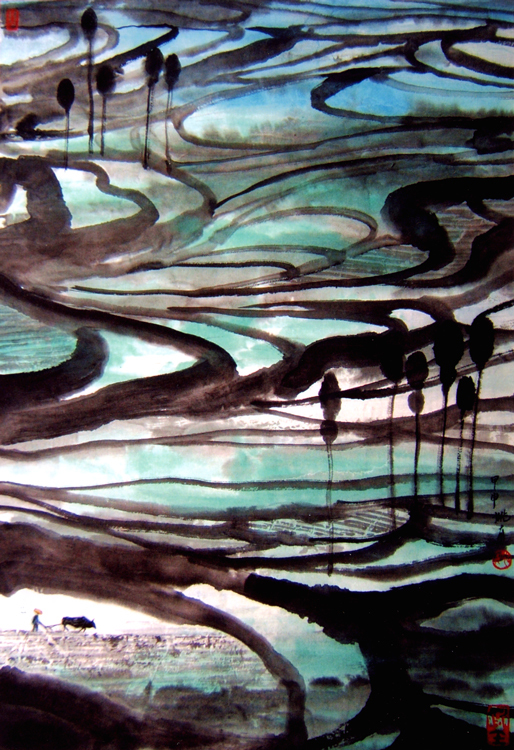 Born in Shanxi Province, P. R. China, Mr. Kui Yao graduated from the Central Academy of Arts and Design in Beijing in 1962, majoring in murals- Two years later, he was commissioned to design and create for the Exhibition Hall in Guilin City a large-scale mural of mosaic porcelain entitled Song of Guilin Mountains and Rivers. In 1979, Mr. Yao was invited to join the prestigious Association of the Chinese Artists. During the next 10 years, he held the positions of Director of Creative Department and of Associate Editor-in-chief in People's Publishing House of Fine Arts of China. In the same period. he also published his own album of Kui Yao's Paintings and was the managing editor of the art series: A Classified Collection of the Chinese Paintings. Cultural Heritage Prize in Taipei in the same year. His works have been on display and collected in art galleries and art shows in many parts of the world, including Japan, the United States, England, Denmark. Canada, Hong Kong, Macao, and Taiwan. In 2000, his new album. Yao Kui's New Paintings Abroad^ was published. He moved to Vancouver in 2002 and was elected to be a member of the board of directors of the Chinese Canadian Artists Federation in Vancouver. He is currently working on new paintings depicting and expressing his impressions of the beautiful Vancouver and lower mainland. Mr. Yao does not stick exclusively to the traditional techniques- He has developed his own style, a special artistic conception based on both traditional and modern forms of expressions. He represents the world around him with an uncultivated simplicity. He excels in displaying the beauty of mountains and waters with lyrical freshness and peaceful joy of life.